"Laying turf in the winter can be a more simple process with equally good results". Do you harvest turf in the winter? Yes we do. Harvesting is not affected by winter weather, other than frozen ground. Can we lay turf in the winter? Yes you can. The winter is often one of the best times of the year to lay your turf as the turf can settle, root and establish before the summer months. Does frost lift newly laid turf? No. The frost has no long term effect on winter laid turf. Can I lay turf that has frozen in the turf roll? Yes you can. Wait for the turf to thaw and lay the turf as normal with no longterm or adverse effects. Turf can actually keep for days or even weeks if completely frozen and de-frosts just like items out of your freezer. Nature allows turf to be unaffected by frozen conditions. Are there any advantages to laying turf in the winter? You will not normally need to water your newly laid turf, which can save you time and money. Turf will establish in the winter months and be ready for summer use. 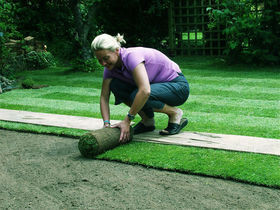 Turf rolls will keep longer before needing to be laid. Is it too late to lay turf? No. As a company we lay turf all year round. What happens if the ground freezes after I have ordered turf? Should the situation arise and the ground becomes frozen after you have ordered your turf, you can proceed with your order and wait for both the turf and ground to de-frost. Or you can contact us by phone and we will be happy to postpone your order as long as the turf has not been harvested and despatched.